CAMDEN COUNTY – A Jefferson City woman started off the holiday period with a trip to jail for assault and Driving While Intoxicated. 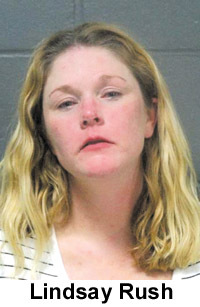 According to the Camden County Sheriff’s Department (CCSD) on May 25 at approximately 11:40 p.m., Camden County Deputies witnessed Lindsay Rush, 38, from Jefferson City, MO., driving carelessly through a crowd of pedestrians in the area of Sweet William Road in Lake Ozark. Rush was contacted by deputies and instructed to pull her vehicle to the side of the road but she refused to stop and continued to drive recklessly through the pedestrian traffic, the CCSD said. Another deputy, (who was on foot) attempted to approach Rush’s vehicle at which time he was struck by the driver’s side door. The CCSD stated that Rush was showing visible signs of being impaired. At that point the vehicle accelerated again putting pedestrians in danger who, along with deputies, were forced to take evasive action to avoid being stuck by Rush’s vehicle. Bond was denied for Rush.